Did you know I’m a planner addict? Every October, I would start shopping for the next year’s planner and then halfway through February, I’d find another planner that I loved and start anew! This would cycle itself over and over all year long and while everyone may have thought I was being wishy washy, I just truly loved the different styles and options that each planner had that I couldn’t stick with just one. A few years ago, I discovered Bullet Journaling and fell in love with its flexibility and practicality. I loved creating a new spread for each week and revamping the monthly spreads based on what was important to me at that moment in time. But still, I would get new notebooks almost monthly because I wanted to change up the style and feel. Eventually, I would be swimming in notebooks and spent more time migrating things over to the planner than I spent actually planning! Then, y’all. Last October, I stumbled upon digital planning through Jess Massey. When I say I went down a rabbit hole, I mean, I tunneled DEEP into the vortex of digital planning. I saw the beautiful spreads on Instagram and loved how completely customizable everything could be. Sure, I liked the less wasteful, paperless aspect of it but I really loved the versatility of it! I mean, getting to change the look and feel on a monthly, weekly or even daily basis? Count me in! But look at the colors that you can choose from with your digital planner! You can also create your own palette of your favorite colors. By using hex codes, you can expand your color options even more. Now, while we’re on the subject of pens. Do you know what the saddest part of paper planning is? When you make a mistake! I have a hate-hate relationship with correction tape and I’m so glad I never have to use that stuff again. With a digital planner, you can just erase! Now, this next feature is going to be a little hard to explain without a video but let’s say that you wrote down an appointment on a specific day but then it changed. Normally, you’d have to scratch it out in your paper planner and write it again on the new date. But with your digital planner, you’ll just “grab” that handwritten text and drag it to the new place on your planner. Easy peasy! Another thing that I loved about bullet journaling is the ability to design your own planner pages based on your needs or creative desire that week. But the downside is that you have to draw your own planner pages for every week! What if you settle on a design that you absolutely love? With digital planning, you can save it as a template to use again and again! No more rewriting the same spread multiple times. One of my favorite things to do in my digital planner, is to add pictures to create a scrapbook style journal or design board. This is my Style Board that I used to help with clothes shopping! It doesn’t matter how many pages you add to your planner, it never gets heavier than your iPad or phone. 🙂 I have my planner, homeschool lesson book and my social media planner all bundled up into one document and I can still take it with me to the park or the store. Instead of recycling or throwing away a planner or pages, you can just delete them out of your planner. You can also reuse the same undated planner templates year after year instead of buying a new planner each year! Maybe you’re like me and you want some flexibility in your weekly spreads. During the school year, I like to have time blocks to keep us on task but during the summer, I don’t use daily or weekly pages but instead, I use empty pages to journal and store pictures! With a digital planner, you can change out your spreads on a daily, weekly or monthly basis! Want to access your planner from anywhere? You can sync it to your phone or other devices so you’ll always have it on you. If you make an edit on your phone, it will sync to your planner on your other devices as well! You can also export your planner (or a single page) as a PDF to share with other people or archive to look back on decades from now. I designed my own planner after searching Etsy and not finding exactly what I wanted. To date, I have designed 4 different planners and I use this one the most. I absolutely love it! Q: What do I need to get started? A: Any tablet or phone, a PDF annotating app, a stylus and a planner PDF file. I recommend an iPad Pro, the Goodnotes 4 app ($7.99), and the Apple Pencil. If you don’t have an iPad Pro, any iPad will work but you’ll need a stylus in place of the Apple Pencil. Q: I only have an Android tablet; can I still use your planner? Q: Do you have how-to videos? You can find my planners in our storefront and in the Etsy shop. You can email me any time with questions! Thanks for learning more about digital planning with me! But now that it’s Jan 3, no more excuses! And I thought what better way to start the year than with this year’s word. A few years back, my team started focusing on a single word for the year – most of the time, this word is business-related and helps to bring back some motivation when we hit a slump. But this year, I needed a LIFE word. Something to help me stay focused on moving forward and not just feeling stuck. Not that there is anything wrong with being a stay at home mom; I actually love being home. And believe me, it’s a ton of work and I’m not reducing the enormity of its importance. I just felt like I was kind of floating through the day, reacting to what needed to be done and every day felt like that movie Groundhog day. For months, I kept telling Tim that I want to do something but I didn’t know what. I have a great family and a great career but something wasn’t quite sitting right. Finally, around the end of the year, I realized that I wasn’t just floating through the day, I was floating through life. I have been “just existing” and for the past year, I haven’t really been working on being someone. A great mom. A thoughtful spouse. An entrepreneur who is willing to try and fail. A centered person. This year, I want to go from wafting through life to someone who is focused on actually being the person they want to be. Not just expecting it to happen on its own but putting in the work to make it come to be. There’s no use in having a word if you don’t have a plan to make it a reality, right? I’ve come up with a few action steps to get me closer to embodying my word. Carve out time to be creative – I know that creating is my life juice. 😉 It lights me up and fills my cup. When I’m creating, I feel most like me. Stay in my lane – I try really hard not to compare myself to anyone else. I love to follow people and be inspired by all that makes them who they are but any time I feel that twinge of comparison, I try to shut it down as quickly as possible. This soup started my love affair with lentils way back in 2007. In 3-quart saucepan, heat sweet potatoes, onion, apple juice and water to boiling over medium-high heat. Reduce heat to medium-low. Cover; cook 5 minutes. 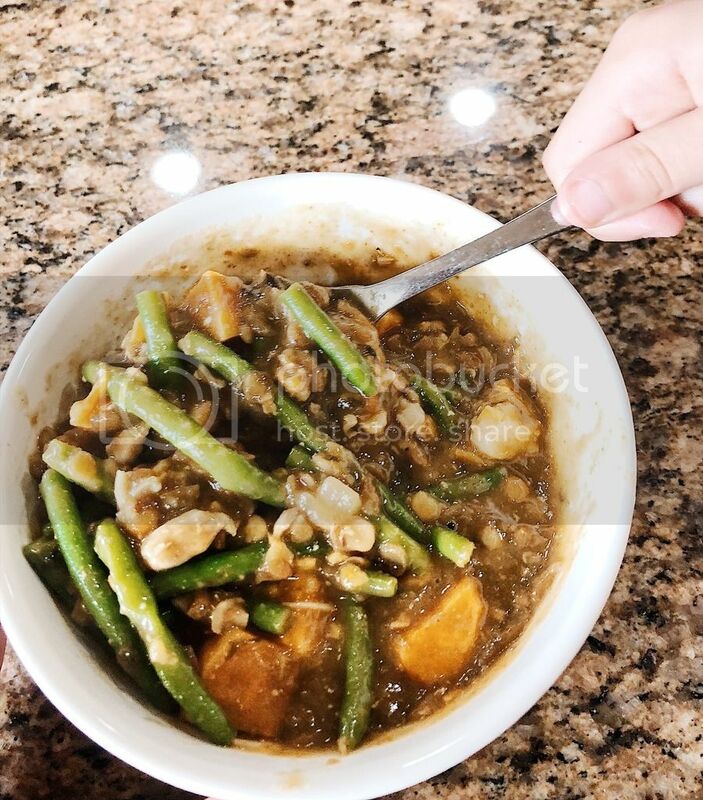 Stir in soup, beans, chicken and curry powder. Heat to boiling. Reduce heat to medium-low. Cover; simmer 10-15 minutes, stirring occasionally, until vegetables are tender.